This article will describe the complete root cause analysis of a recent Java deadlock problem observed from a Weblogic 11g production system running on the IBM JVM 1.6.This case study will also demonstrate the importance of mastering Thread Dump analysis skills; including for the IBM JVM Thread Dump format. A major stuck Threads problem was observed & reported from Compuware Server Vantage and affecting 2 of our Weblogic 11g production managed servers causing application impact and timeout conditions from our end users. The first thing to do when dealing with stuck Thread problems is to generate a JVM Thread Dump. This is a golden rule regardless of your environment specifications & problem context. A JVM Thread Dump snapshot provides you with crucial information about the active Threads and what type of processing / tasks they are performing at that time. Conclusion: both Weblogic Threads #8 & #10 are waiting on each other; forever! 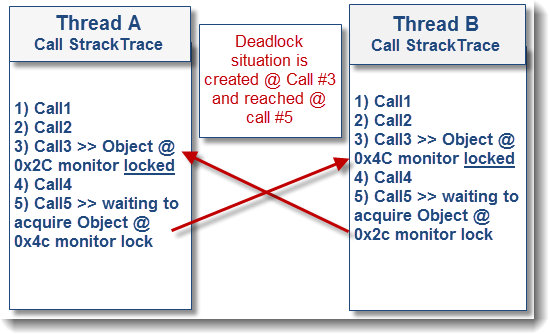 Now before going any deeper in this root cause analysis, let me provide you a high level overview on Java Thread deadlocks. Most of you are probably familiar with Java Thread deadlock principles but did you really experience a true deadlock problem? From my experience, true Java deadlocks are rare and I have only seen ~5 occurrences over the last 10 years. The reason is that most stuck Threads related problems are due to Thread hanging conditions (waiting on remote IO call etc.) but not involved in a true deadlock condition with other Thread(s). Thread deadlock is confirmed…now what can you do? - Thread deadlock is triggered! Our team is currently planning to integrate this Spring patch in to our production environment shortly. The initial tests performed in our test environment are positive. I hope this case study has helped understand a real-life Java Thread deadlock problem and how proper Thread Dump analysis skills can allow you to quickly pinpoint the root cause of stuck Thread related problems at the code level. Please don’t hesitate to post any comment or question.